We’ve arranged a series of public speaking tips to help you with better presentations and speeches. We are confident you’ll appreciate them because all the tips feature in our training. You too can benefit from these tips. First, you can watch the tips here. Or, second you can receive the public speaking tips direct to your email. Or, of course, you can join us on a public speaking course. You might be tempted to judge a book by its cover. But if you do so, you might also be judging its title. That’s because a title is really important. So, if it’s a book, a film or a speech the title suggests something to an audience. And, of course, it’s your job to make sure that it’s something positive. Because you need to use the title to attract an audience for your speech. This Michael Gove speech has a good effort with its title. But it still managed to lose the plot. 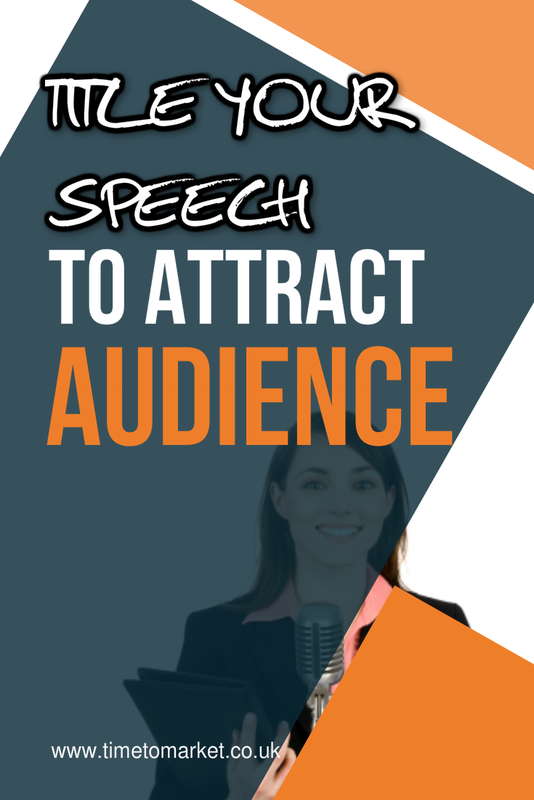 Your job as a speaker, or a speech writer, is to make sure that your speech title has value and, of course, is interesting. Therefore, to help you with your speech titles, here are pointers to help you get to grips with titles. Your title must suggest value to your audience. And, of course, it must offer benefit to your audience members. Plus, it must offer something of significance. Because you have a really demanding audience you have to make sure that they know what’s in this speech for them. So they aren’t going to waste their time listening to material that’s of no value or just isn’t significant to them. Yes, it sounds painful. But, you have to do it. Focus your title on the value. Keep it exciting and upbeat. Timetomarket.co.uk © 2019 | All Rights Reserved | PresentPerfectTM is the registered trademark of Time to Market Ltd, Sandford Gate, East Point Business Park, Oxford, OX4 6LB | Tel: 01344 859823 | training@timetomarket.co.uk | Time to Market offers effective presentation skills, public speaking training courses and one to one coaching for presentations and public speaking.